INDIANAPOLIS (AP) — Paul George scored 36 points and Lance Stephenson added 22 points and 12 rebounds, leading the Indiana Pacers past the Los Angeles Clippers, 106-92 on Saturday night. Indiana (32-7) has won four straight, all by double digits, though missed a chance to win four in a row by 20 or more points for the first time in franchise history. The Pacers retained the league’s top record and improved to 21-1 at home before heading West for a five-game road trip. Jamal Crawford scored 22 points for the Clippers, who had their five-game winning streak snapped. 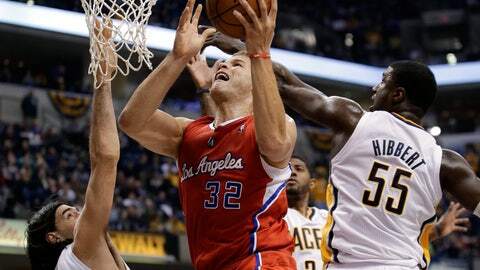 Blake Griffin had 19 points and DeAndre Jordan added 12 points and 17rebounds. After falling behind 13-6 in the first 4 minutes, the Pacers cracked down and gave up only 14 points over the next 14 minutes as they took a 45-27 lead. The Clippers never got closer than nine after that. Indiana did all that despite David West getting ejected at halftime for a flagrant 2 call and with his backup, Luis Scola, and All-Star center Roy Hibbert watching the entire fourth quarter from the bench. How did the Pacers do it? The same way they’ve won all season. They held the high-scoring Clippers to 39 percent shooting from the field, beat them on the glass, outscored them in the paint and thwarted the Clippers’ momentum every time they started to get some. Indiana turned the tables quickly after those first few minutes. The Pacers answered Los Angeles’ opening punch with a 12-2 spurt to take an 18-16 lead with 3:16 left in the first quarter. The Pacers never trailed again. Instead, they made it 28-18 after one quarter, extended the margin to 45-27 midway through the second and continued pulling away most of the night. The only real obstacle came after a replay review appeared to show West’s elbow making contact with Griffin’s head as the two scrapped for a loose ball after Griffin missed a layup at the buzzer. The Clippers scored eight straight in the third to get within 67-53 and got as close as 81-72 when Crawford hit an 18-footer with 10:26 to go. But the Pacers responded with a 17-4 spurt to seal it.